Accessing the AAPA’s key services has become faster and easier with launch of AAPA Online. The roll out of this new system allows Territorians to lodge applications for Authority Certificates and Requests for Information online. 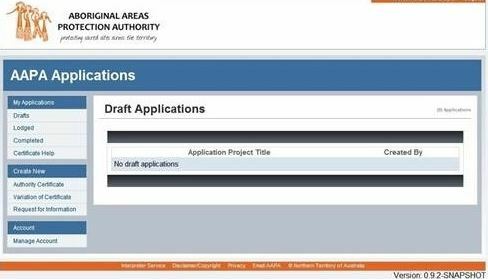 By using AAPA Online, Territorians can also manage their applications and access real time information about their applications’ progress. The new AAPA Online can be accessed by anyone using PCs, mobiles, laptops and tablets. “The Authority is committed to embracing digital technologies and initiatives to meet the needs of our stakeholders”, said AAPA CEO Dr Ben Scambary. The launch of AAPA Online marks the beginning of the AAPA’s work to redevelop its IT systems and which will eventually lead to the upgrade of its sacred sites database, which contains 30 years sacred site data.